When I visited Daniel Botkin of Laughing Dog Farm some time ago, he showed me how he did a lot of planting in goat manure-laced hay. I envied his access to so much bedding because it does provide plants with nutrition and eliminates weeds. No fertilizing. No weeding. He is a lucky man to have manured goat bedding from his barn, as well and old hay bales. He said he doesn’t use the hay bales for planting until they have aged and rotted for a year. Any weed seeds would have sprouted and then died before he used it for planting. Lacking goat bedding, I thought I would try planting in a straw bale which seems to be one of the new trends this year. No fertilizing and no weeds. Actually I have to confess that I tried this project the summer of 2010, but failed miserably, so I know all the mistakes there are to make. The first mistake I made was not locating my bale where I would see it and remember to water it every day, just as I would water any container planting. The second mistake was not preparing the straw bale ahead of time, which is to say, not keeping it soaked for two weeks to start the rotting process. This time I located the straw bale right at the end of my herb bed in front of the house, practically right next to the water spigot. I set it on top of a couple of layers of plastic sheeting to prevent weeds from growing into it. Every day for two weeks I watered the bale, sometimes letting water drip slowly into it, and sometimes pushing the hose nozzle deeper into the bale from different angles. Hay and straw are very firmly packed into their bales and they can absorb a lot of water. You can plant anything you want in a straw bale, and this technique is useful if you have limited space, really poor soil, or even no soil. You can just set the bale on a cement walkway. This week I bought a six pack of Sweet 100 cherry tomatoes, two of which will be planted in my bale. The mature plants can just rest on the bale and I won’t have to worry about the tomatoes rotting on wet soil. So far things had been going well. No hard work at all. However, now I had to cut two planting holes into the bale. I pressed my husband Henry into service and gave him my Hori knife, a big, sharp serrated knife designed for use in the garden. Once again, a reminder. A packed straw bale is very dense. Cutting into it is very difficult even with a Hori knife. It didn’t help that it started to rain as he worked. The knife became slippery – and slipped. Blood everywhere, but no stitches required. First aid attended to with a necessarily absorbent bandage, he retired. I put the knife aside and pulled enough straw out of the holes he had hacked out to hold a couple of quarts (approximately) of compost for planting. After half filling the holes with compost, I followed my usual tomato planting technique. I removed the bottom couple of branchlets from my two seedlings and put one in each hole deep enough to cover at least half the stem, and watering as I would any half planted seedling. I added more compost to fill the hole, and watered again. The rain is continuing, on and off, as I write, but I will continue to water the straw bale and not depend only on rainfall. I will keep you posted on the progress of the tomatoes. I already used the straw I pulled out of the bale to use as mulch in the vegetable garden. I am wondering if I can get two planting seasons out of the bale, or if it will be suitable only for mulch in the spring. More information gathering required. I like this addition to the herb bed which runs along nearly two thirds of the front of our house. 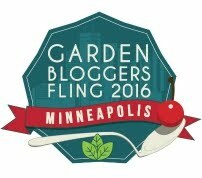 Part of the final third is the Early Garden where I planted greens under floating row covers this spring. 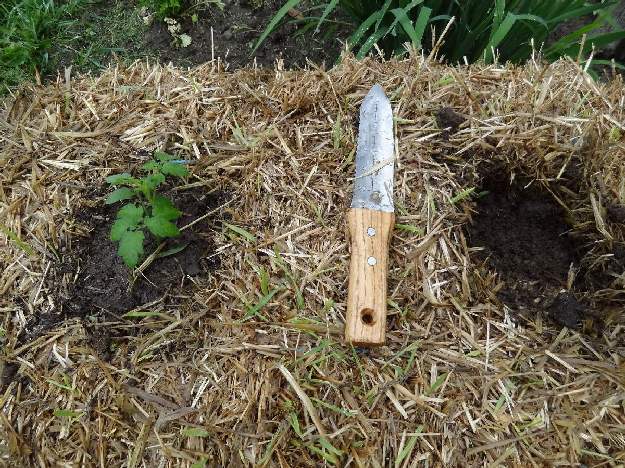 The row covers have a dual purpose, to allow a jump on the growing season, and especially to foil the rabbits that ate most of my garden last year. We have seen the rabbits, and seen the damage they did to ornamental alliums in the Lawn Beds, so I know they are around and hungry, but they have not been able to get my beautiful lettuces. We have been eating delicious green salads out of the Early Garden for the past two weeks which is a record for us. Although I am no longer worried about frost, I am keeping the floating row covers on. They do actually float over the tops of the mature lettuces without constraining them in any way. The rabbits remain foiled. I will do an update on my blog again this week, Pat, but thought you’d like to know that the tomatoes I planted in the bales are doing really well. So are the potatoes. It took more than two weeks for my bales to get soft enough to plant in, but it was cooler weather then. Having a plastic tent over the bales part of the time also really helped soften things up and get the tomatoes established. I once read that adding dried blood to the bale in the planting area and then covering the bale with plastic sheeting for a couple weeks prior to planting, aids in the decomposition in the center of the bale making planting easier. Just a thought. I will be happy to see your tomatoes in fruit. Mary and Layanee – I did try to soften the interior of the bale, but I cheated on the two week prep time and I wish I had known about using plastic sheeting – next year. Sometimes my column deadlines drive what I am doing in the garden. Probably not the best idea. Dee – Hmmmm. Potatoes in buckets. I haven’t heard about that. I’ll be watching. Pat, I wonder if a reciprocating saw could cut the holes in the bales more easily? It’s worth a try. I’m not sure how hay straw bales would work for me but maybe pine straw bales would!